Party Animals Jumping Castles did a 1st Birthday Party for a little boy called Tyrone. 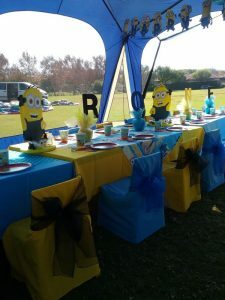 We did a Minions birthday themed party and the party took place at The Village Green, Pecanwood Estate, Hartebeespoort Dam on Saturday 18th June 2016. 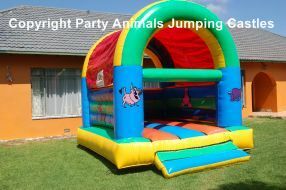 Party Animals Jumping Castles delivered the Jumping castles and all the party equipment for kids as well as some equipment for adults early in the morning, between 08h00 and 09h00. The party was scheduled to start at 11h00. 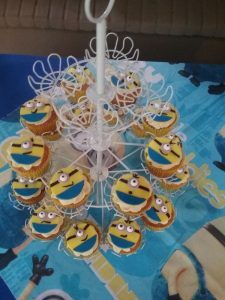 The Minions Birthday complete party setup for the kids was done by myself and my husband. Party Animals Jumping Castles did table settings for 20 kids. All the kids furniture, linen and décor supplied and used is the property of Party Animals Jumping Castles. 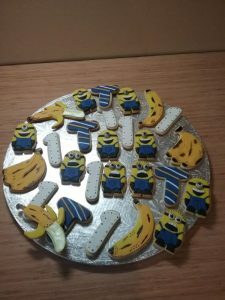 My Husband designed the Happy Birthday banner and Flags in the shape of Minions. We also did a balloon arch to the entrance of the little tent that was used to set up under. All the décor was handmade. 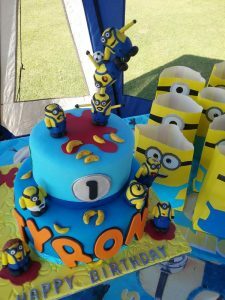 Party Animals Jumping Castles personally baked the Minion Birthday cake, a 2 Tier Chocolate cake with 3D Minions figurines on top. All the decorations on the cake was made of edible icing. The birthday boy’s mommy supplied the contents for the party packs. She also rented 2 Jumping Castles from Party Animals Jumping Castles: The Obstacle Jungle Slide and a 3 In One castle that has a ball pit for the smaller kids. The Obstacle Jungle slide was a sure hit with the older kids as they loved climbing the cargo net at the back and then sliding down the front. The 3 in One castle was more suitable for the younger kids and they toddlers loved playing in the ball pit. 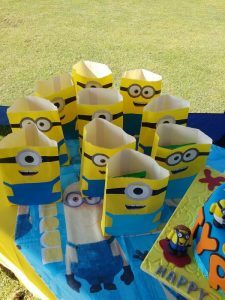 Party Animals Jumping Castles also supplied some glasses, cutlery and crockery, steel urn and Juice Dispensers for the adults. 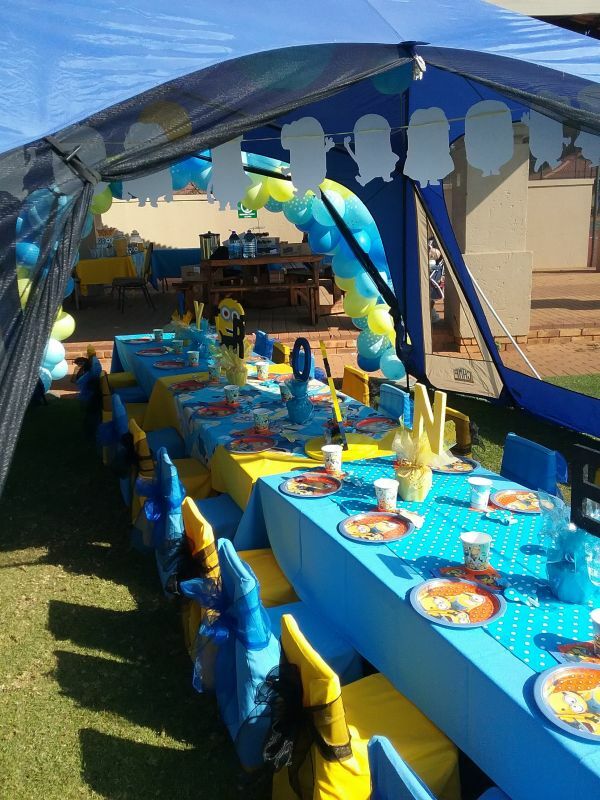 Along with some table cloths and overlays in the Minions Birthday theme. We stayed I the area for the duration of the party and collected and packed away the equipment at 16h00. The mom and some family members thanked us for a lovely setup and an enjoyable party. If you have a special occasion or event and need anything party related. 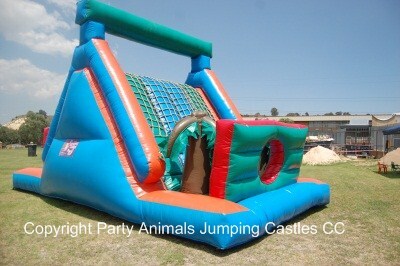 Give Party Animals Jumping Castles a call on 084 400 8008 to book your Jumping Castle and Party equipment.